Wil-Kil Pest Control, headquartered in Sun Prairie, Wis., was recognized as a winner at the Dane County Small Business Awards. The awards breakfast was held on June 4 at the Sheraton Madison Hotel, and headlined by keynote speaker Peter Gunder, Chief Business Development Officer for American Family Insurance Group. In its 33rd year, the Dane County Small Business Awards celebrate small businesses and the contributions they make to local communities and the economy, demonstrated through maintaining a responsible and rewarding workplace environment and giving back through charity work and service. Recognizing 10 companies each year, the awards are given to businesses as a whole, identifying the role all employees play in the success of a company. Wil-Kil was recognized during the award presentation for having the most experienced technician staff in the Midwest, with more Associate Certified Entomologists (ACEs) and Wisconsin Pest Control Master Technicians than any other Midwestern pest management company, and for its dedication to ensuring positive client experiences. To view the full list of 2015 Dane County Small Business Award Winners, visit https://bus.wisc.edu/cped/sbdc/dane-county-small-business-awards/previous-award-winners. 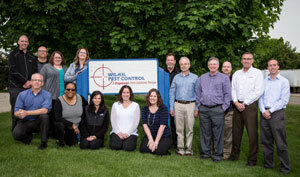 Founded in 1924, Wil-Kil Pest Control is a regional pest management company that provides quality pest management for residential and commercial properties throughout the Upper Midwest – including Wisconsin, Minnesota, the Upper Peninsula of Michigan, parts of Iowa, Chicagoland and all of Northern Illinois. It is an operating division of Copesan Services, Inc., with offices located in Sun Prairie, Menomonee Falls, Eau Claire and Appleton, Wis.